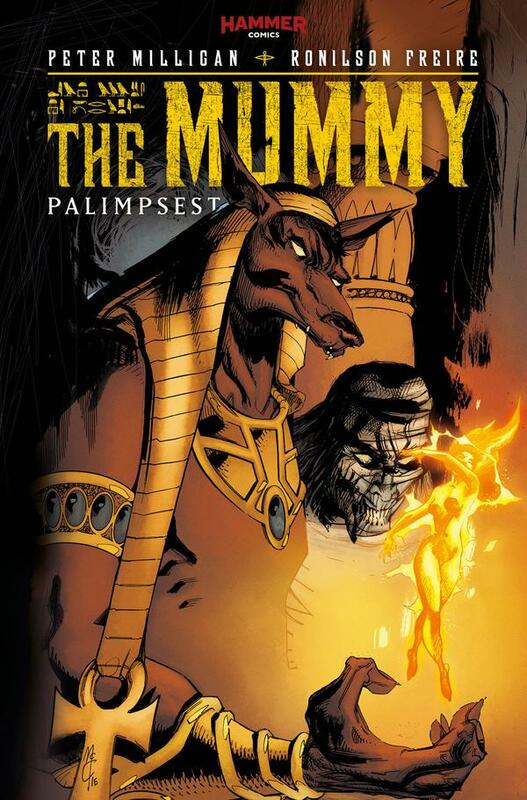 The Fellowship was fortunate enough to obtain a copy of THE MUMMY: PALIMPSEST #1 from Titan Comics. Peter Milligan writes, Ronilson Freire draws, Ming Sen colors, and Simon Bowland letters. The Sect of Anubis is a cult who preys on women with a very specific birthmark – they restore their own life with the sacrifice of those who bear the Mark of Kharis. Their latest victim is a woman called Angel, who is an illegal immigrant brought to London on the pretense of a job. But the sacrifice ritual awakens something in Angel, giving her the memories of the first sacrifice. While this book bears the Hammer Comics banner, it reads much more like an adventure story than horror. It has some interesting conspiracy twists to it, or at least the potential for them, but Angel is definitely a fighter, unafraid to attack a man with a gun while she is unarmed. A great deal of care has been taken with the backstory in this issue, and the art gives us an apparently normal, modern world with a hint of terrible things happening in the darkness. Angel’s world has been completely torn asunder, and she’s bent on finding out what’s happened to her. And maybe she has an ally out there. Pick this one up and follow her story. THE MUMMY: PALIMPSEST #1 is available now at your FLCS or at titan-comics.com.